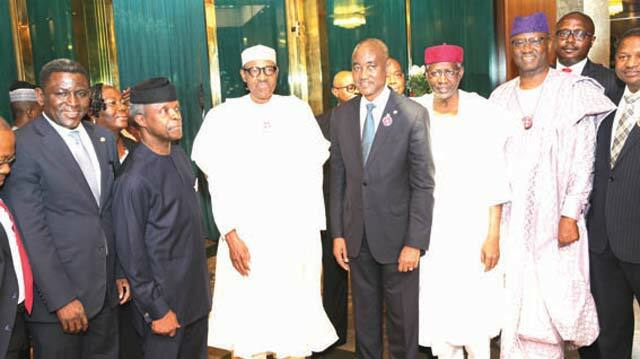 NBA General Secretary, Aare Isiaka Abiola Olagunju (left); Vice-President, Prof. Yemi Osinbajo (SAN); President Muhammadu Buhari; NBA President, Abubakar Mahmoud (SAN); Chief of Staff to the President, Mr. Abba Kyari; Secretary to Government of the Federation, Mr. Mustapha Boss; former General Secretary NBA, Mr. Emeka Obagolu JP and Attorney-General and Minister for Justice of the Federation, Abubakar Malami (SAN)‎ during NBA’s visit to the President in Abuja. President Muhammadu Buhari has praised the Nigerian Bar Association (NBA) for setting up task forces to help in promoting peace and reconciliation in Northeast and South south.He said his administration would not have succeeded without lawyers’ support. The President spoke when NBA leadership visited him at the State House in Abuja.He expressed happiness with the courtesy call and praised NBA President, Abubakar Mahmoud (SAN), who led the delegation, for his fearless disposition in the defence of the rights of Nigerians and the enthronement of the rule of law. Buhari said his administration remains committed to providing security, recovering looted assets and prosecuting the ant-corruption war. “In doing this, we require the input of the Bar and Bench. Lawyers have been busy since this administration came in and have played critical roles in the recovery of looted assets.“Your support in the current initiatives of government in ensuring judicial integrity is in the best interest of government and Nigerians. “We must embrace the rule of law for the country to move forward. And I thank the NBA for making huge contributions to the success of this administration,” he said. 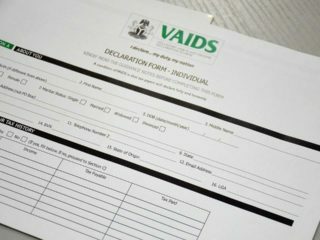 The President said several lawyers have been playing key roles in his administration, such as Vice-President Yemi Osinbajo (SAN), Secretary to the Government of the Federation, Mr. Boss Mustapha, Attorney-General of the Federation and Minister of Justice, Mr. Abubakar Malami (SAN), Chief of Staff to the Vice-President Mr. Ade Ipaye, who were all present during the visit.He thanked lawyers and Nigerians for their prayers when he was sick and for their best wishes when he marked his 75th birthday. 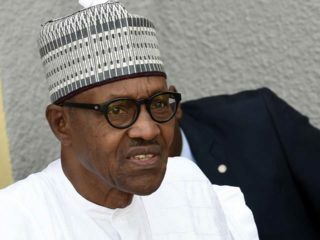 Buhari said his administration remains focused on security, combating insurgency, providing good governance, growing the economy and guaranteeing welfare of citizens.According to him, the government has made great strides in tackling insurgency in the Northeast.He said he would not rest until issues such as Biafran agitation; crises in Taraba and conflicts between herdsmen and farmers in different parts of the country are solved. Mahmoud restated NBA commitment to safeguarding the rule of law.He said: “Our constitution enjoin us to protect the independence of the Judiciary and also the independence of the legal profession, both of which are considered critical components of all democratic societies.”The NBA President commended Buhari for his successes in the Northeast, saying insurgency has been contained, but noted that more still needed to be done. “We salute your steadfast leadership and congratulate men and women of Nigerian Armed Forces for these successes. We are of course aware that a lot remains to be done to completely secure the region.“We are also aware that insurgency is a complex regional problem that requires multifaceted approach. We, therefore, wish to encourage the government to do more to secure the North East Region,” he said. Mahmoud identified other flashpoints of conflict which must be addressed, such as the situation in the Niger Delta, the lingering Biafran agitation in the Southeast, the various communal conflicts in Southern Kaduna, the Plateau, Taraba, and the recurring feud between the herdsmen and farmers across many states.“All these remain significant issues and have continued to undermine the peace and security in the country. We want to urge your administration to continue to do more to improve peace and security,” he said.Mahmoud highlighted NBA’s contribution towards addressing the issues. He recalled that in October 2016, he set up two task forces: the Niger Delta Task Force and the North-East Task Force. He said they were charged with coordinating the association’s intervention in the two regions with the ultimate aim of promoting peace, reconciliation, rehabilitation and reconstruction.“In the Northeast for instance, the justice sector has all but been destroyed for most part of Borno State and parts of Yobe and Adamawa States.“We are mobilising to support the rebuilding of justice sector institutions. We are also working to support the victims of these conflicts. We have been able to attract international support to aid our intervention,” he said. Mahmoud commended the President on his efforts and successes in promoting good governance, fighting corruption and getting the economy out of recession.He said the NBA was willing to contribute towards reviving the economy. “We are aware much has been achieved in the two and a half years of your administration. 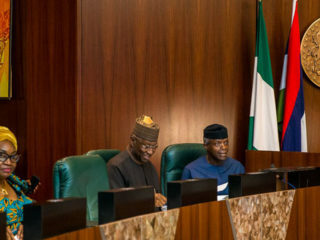 We do not in any way underrate the enormous challenges of governance and the problems that your administration inherited.“We are also aware that many new initiatives have been introduced to enhance economic management, address issues of youth unemployment, extreme poverty and improve the diversification and competitiveness of the Nigerian economy. “The NBA has the requisite expertise amongst its members to contribute to policy work in all the areas of the economy and we are willing to cooperate and work with government to improve economic management in all sectors,” Mahmoud said.The NBA President presented a Policy Book containing specific recommendations on governance and economic management to President Buhari. 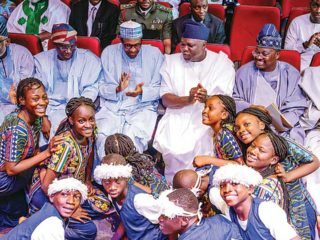 The recommendations are based on the outcome of the association’s last Annual General Conference held in Lagos.“We are confident that the recommendations if implemented will significantly improve the economy, enhance prosperity and build more confidence in the country especially amongst its youth who are increasingly being frustrated by lack of opportunities,” Mahmoud said.